Made from strong borosilicate glass, each cup is microwave safe, BPA-free, and modeled after standard disposable coffee cup sizes. Dimensions (in packaging): 6.7" x 3.9" x 6.7"
I loved this so much I picked up another at the store. Just be sure your bevvy is not TOO hot. LOVE THE COLOR [ BLACK, LIME GREEN] USE THEM EVERY DAY FOR MY COFFEE. They are cute ...but I wish they came in bigger sizes. IT IS THE BEST THAT I HAVE SEEN AND USED. PLAN ON GETTING MORE THIS SUMMER. Meet Joco. The reusable glass coffee cup from Australia that cares about everything from your taste buds to mother nature. 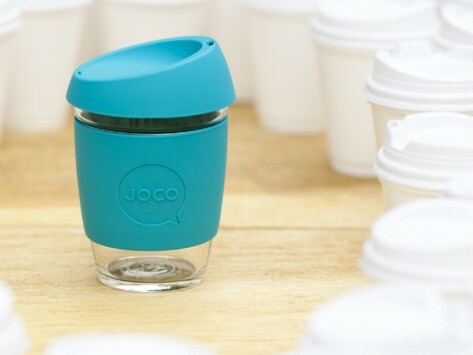 Unlike plastic and paper to-go mugs, Joco Cups are made of boroscilicate glass that is as durable as it is lightweight (not to mention naturally BPA-free and food grade safe). No plastic aftertaste. And, no trees cut down for the sake of your morning ritual. Joco Cups feature a silicone thermal sleeve to keep your coffee hot and your hands cool. The unique base shape pulls the contents of your beverage to the center to help ensure balanced taste. The folks at Joco have left no detail uncovered. Even the lid has been thoughtfully designed for sipping without splashing and providing clearance for noses of all shapes and sizes. Everything from the glass to the packaging is environmentally safe and 100% recyclable. 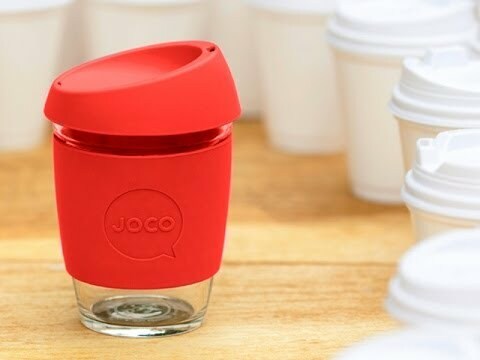 Each Joco cup comes in a nifty container making it a great gift for the coffee lovers in your life. When you’re on the go and you want to taste your coffee, not your cup, Joco has you covered.